This may sound weird to some people but the Malaysian capital of Kuala Lumpur was a very memorable stop for us. For the first time in eight months we decided to step away from the tourist trail and put our energy towards doing some actual work. Jono and I had been chatting for a few moths about taking on some voluntary work and give something back to an area other than our pennies and queens heads. Many fellow travellers recommended using HelpX to find volunteer placements and sure enough after registering and a little research we found a perfect match, an up-cycling enterprise operating in a suburb in Kuala Lumpur. Biji-Biji is the brainchild of a small multicultural group of friends who wanted to advertise sustainable living across Malaysia. Since coming onto the scene two years ago they have tried their hands at any project opportunity within grasp. Art installations, business fairs, concerts, training courses, furniture manufacture they do it all and with mainly recovered waste materials. With backgrounds in environmental management and cabinet making biji-biji was the perfect volunteer vocation for Jono and I. In two and a half weeks we worked on creating Chinese lanterns from water bottles for the New Year exhibition at a shopping centre and Jono assisted in a transforming an office space with wall panels made from recycled pallets. The best thing about biji-biji was meeting many interesting people. Some local, some from various corners of the world, some creators, some grafters, some entertainers but all were friendly, welcoming and unique. Its still early days for this small enterprise but if anyone can make an impact on changing the lifestyle and mind set of the Malay people to see value in waste its Rashvin and the gang. If your visiting KL and are interested in volunteer work Biji-Biji are always looking for extra helping hands. Contact them direct through the Biji-Biji Facebook page or search for them on HelpX if you have an account. The guys at biji-biji were pretty laid back and were always willing to allow us time at weekends and some weekdays for sightseeing. Kuala Lumpur is a large city but unlike other Asian capitals you don't really feel the population density. Sure its busy some times on the metro but you rarely feel claustrophobic. The place is noticeable more clinical and modern than the rest of the country especially around our first tourist stop, the Petronas Towers. This international architectural icon is a beacon of wealth, success and progress. The affluence of the business district is immediately obvious with the grand array of designer stores, hotels and restaurants catering for the hoards of cash rich entrepreneurs who are now the mainstay of the cities elite upper class. Although most of the areas activities are limited to shopping, eating and drinking, there are a few spots to drag visitors away from such tedium who may not need the latest Ralph Lauren polo shirt or look at the price on a Louis Vuitton belt and think "I can live for a month on that cash in Laos". 1) On the upper floor of KLCC Mall you will find Galeri Petronas which showcases a collection of contemporary and modern creations from Malaysian and international artists acquired by the company over the years. For a private collection its a good sidetrack for half an hour and it's Free Admission. 2) Another Free area just outside KLCC mall is the adjacent KLCC Park. Don't let the imaginative name fall you this green space is a nice oasis amongst the modern steel-clad infrastructure. Bring your swimming trunks along as the park features a small shallow pool which is a great way to escape the midday heat. Grab some takeout grub from the mall food court and people watch from a shady bench for an hour whilst enjoying the vista of towering sentinel structures. 3) On the far side of KLCC Park lies another popular attraction. Aquaria is renowned locally as Malaysia best aquarium and although the last such places we've visited were at SeaWorld, Florida ten years ago and a Sealife centre in Hunstaunton, Norfolk in 1996 (I think) this place is certainly no washout (sorry about the pun). We visited Aquaria with our Malaysian friend Mikhail and it was a great day out. If your a fan of the series river monsters the amazon section will make you think twice about having a swim in Brazil. 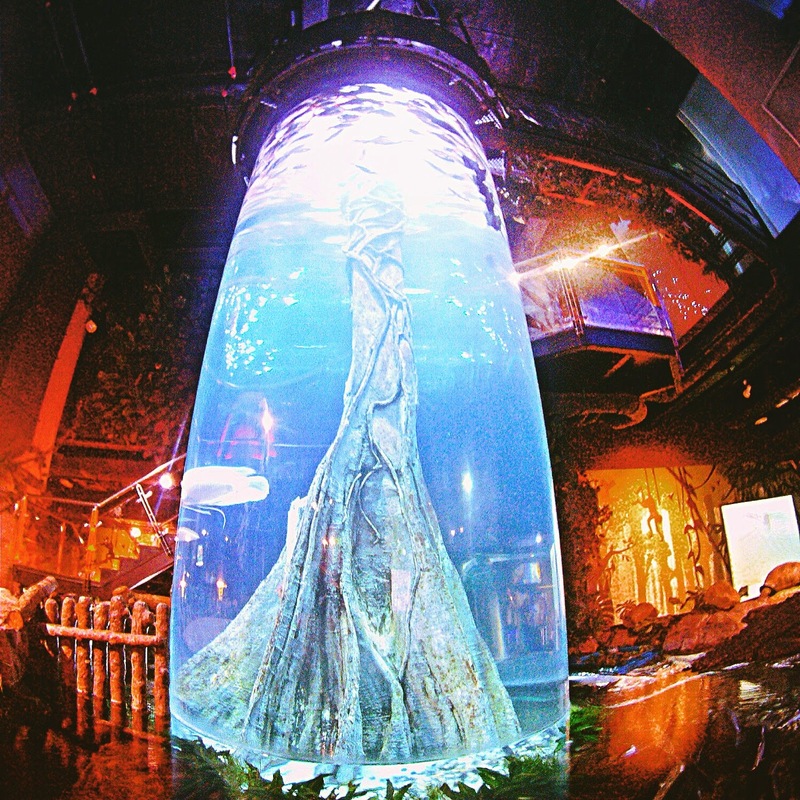 The attractions showcase is a 90m travelator tunnel walk beneath a tank containing many tiger sharks and huge rays. 91 hectare space incorporates the cities impressive National Monument with an awesome view of the city, deer park, orchid garden, butterfly park, national museum, planetarium and more. Its a full day exploration on its own. KL will hold a lasting memory with us not just because we had work to do for a change. We met up with Mikhail who we last saw in Penang whilst he was on holiday. Makhail was kind enough to meet us in the centre on one occasion to guide us around a few sights and introduce our taste buds to some new cuisine. After spending much time trying local curries it was a nice change to try two popular Malay desserts. Ais kacang (known as ABC) and Cendol are sweet dishes often seen as unusual to western eyes due to the presence of ingredients like red (kidney) beans and sweetcorn but don't be put of by the description as both really work well with the ice cream, crushed ice, grass jelly and coconut milk. Sure it looks like the outcome of leaving lit fireworks in a refrigerator but I like it. 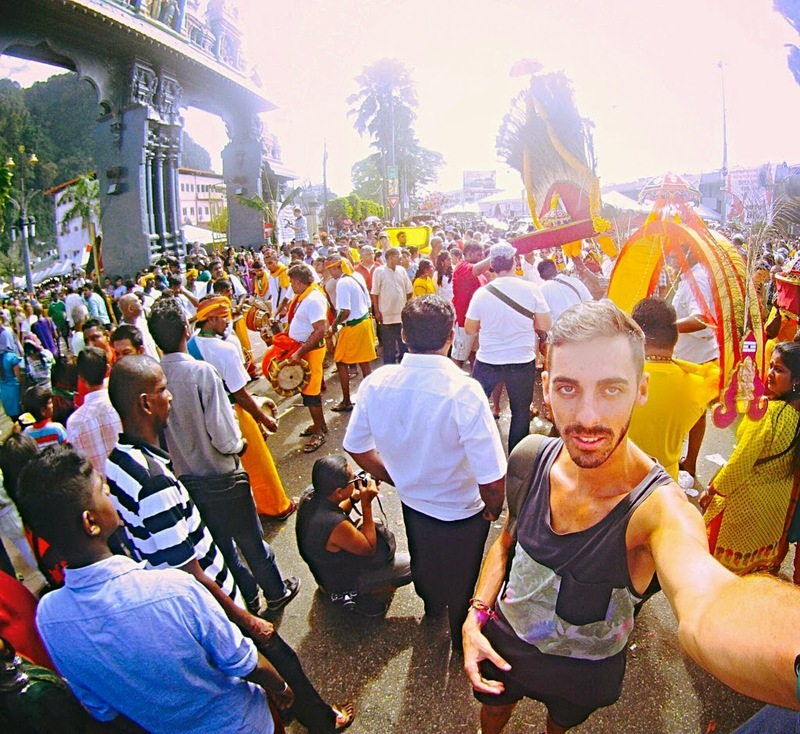 For the first time on our travels we actually managed to time our stay with a local festival and in early February the Hindu festival of Thaipusam is a big deal. Kuala Lumpur is actually one of the only places left outside India where this event takes place and the temple at Batu Caves on the city outskirts provides the perfect setting. Thaipusam coincides with the full moon on the month of Tamil (January/February) and is famous worldwide due to the actions of the devotees involved in the pilgrimage. The devotees must fast, live a life of celibacy and only eat pure Satvik food once a day for 48 days before the big day. On the day their heads are shaved and they must complete a pilgrimage to Batu Caves from the city centre whilst undertaking burdens (kavadi). These burdens range from carrying pots of milk to piercing the skin, tongue and cheeks with hooks or skewers. We saw one guy who had that many hooks in his back he resembled a fishing tackle shop. The most popular kavadi is a decoraded wooden frame (although many we saw contained metal rods to strengthen the structure) which the devotees carry on their shoulders along the entire route. Needless to say the days events takes its toll on someone who has fasted for so long and many participants seem to wonder aimlessly to their goal in a trance like state with friends and family making sure they don't collapse under the intense heat. The festival was a complete crush of people and colours with music playing and devotees chanting but one of the most spectacular gatherings you can possibly see. If you in KL in late January early February grit your teeth, bear the claustrophobic conditions and get your camera ready because you wont be disappointed. Many backpackers underestimate KL labelling it up as "just another expensive capital city" but if you scratch beneath the surface and throw yourself out of the clinical epicenter and perhaps say with locals you will see a multicultural metropolis full of character and charm. Sure the cost of a pint is a rip off but a little detox never hurt anyone. Oh yeah I forgot one thing. For those who read the last post here is the promised picture of a cat courtesy of Mikhails's family. Enjoy and thanks for reading.